There are no snakes at the Shuili Snake Kiln. 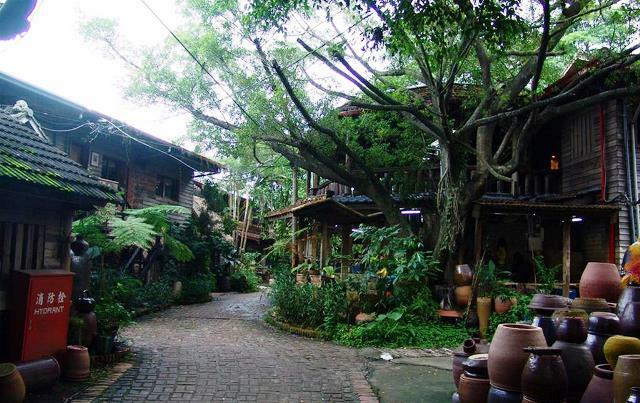 Instead, the place is where beautiful Taiwanese pottery is made. A head-turner is the gigantic two-mouthed piece of pottery that was included in the Guinness Book of World’s Records as the largest ceramic of its kind. Another crowd drawer is the 921 Earthquake Commemorative Pots set. The widely known kiln began in 1927 when Lin Chiang-sung, a master potter, arrived in Shui-li, a small town in Nantou County. He loved his new home and was impressed to see the winding hillsides that seemed to be slithering like a snake. He also discovered that his newly found town had plenty of available clay and timber to heat his kiln. Challenged to show the town what he was good at, he built is workshop and called it “Snake Kiln’, pertaining to the meandering hillsides. The kiln and his pottery were an instant success. Today, Snake Kiln is still riding on its old trade and popularity. It is now managed by a third-generation master potter, Lin Kuo-jung. He believes that this historic kiln continues to produce quality ceramic bowls, plates, jugs and so on. But what’s truly amazing about Kuo-jung’s new style of management is that he transformed this old kiln into an important cultural park. The once humble kiln now has a gallery, museum, 921 Earthquake Memorial, and pottery classrooms that teach people about the history of ceramics and pottery-making. And for tourists to appreciate pottery more deeply, they are allowed to work on the clay and make their own artistic creation. The Snake Kiln also conducts special events such as wood-burning kiln exhibition using traditional kiln. Through traditional methods, the master potter teaches his students how to use ash to create the perfect glaze. In such cases, the kiln must be fired for three days straight while keeping the heat at perfect temperature. It is not an easy task, but one that requires mastery and patience. A master potter knows when to heat or stop heating by simply looking at the glaze. Inside the pottery museum are several pottery items that were used in Japan and Taiwan in the 1950s. The gallery also features different ceramics displaying different artistic styles. The kiln also has an information center, multimedia center, coffee shop, a molding room, an art room and pottery room. This workshop-turned-gallery is located on Dingkan Lane, Dingkan Village, Shuili Township in the picturesque county of Nantou. Nantou County in Central Taiwan receives millions of tourists and visitors each year for its amazing natural attractions. It is specifically visited for its many hiking trails, natural reserves and the enigmatic Sun Moon Lake, which is widely known by backpackers, adventure seekers and nature lovers across the globe. To get to Shuili Snake Kiln (Longitude/Latitude: 23.801742,120.865385), take Freeway No. 1 going to the Changhua System Interchange and take Freeway No. 3. Exit at the Mingjian Interchange and proceed to Provincial Highway No. 3, going to Provincial Highway No. 16. When taking the bus, simply get off the train at the Shuii Railway Station and take a Fengrong Bus to Snake Kiln stop.